GREENBELT, Maryland, August 10, 2011 (ENS) – The earthquake and tsunami that struck Japan in March were strong enough to send waves to Antarctica that broke a chunk of ice twice the size of Manhattan off the Sulzberger Ice Shelf some 8,100 miles (13,000 kilometers) away. Kelly Brunt, a cryosphere specialist at Goddard Space Flight Center, Greenbelt, Maryland, and colleagues were able to link the calving of icebergs from the ice shelf with the tsunami, which originated with a 9.0 magnitude earthquake off the coast of Japan on March 11. The finding, detailed in a paper published online Monday in the “Journal of Glaciology,” marks the first direct observation of such a connection between tsunamis and icebergs. The earthquake off the coast of Japan caused massive waves to explode out from its epicenter. Swells of water swarmed toward an ice shelf in Antarctica, and about 18 hours after the earthquake occurred, those waves broke off several chunks of ice that together equaled nearly 50 square miles. The Sulzberger shelf faces Sulzberger Bay and New Zealand. According to historical records, this particular piece of ice had not moved in at least 46 years before the tsunami rolled in. After looking at historical satellite imagery, the researchers determined the small outcropping of ice had been there since at least 1965, when it was captured by USGS aerial photography. 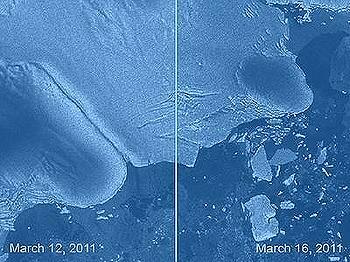 Using multiple satellite images, Brunt, Emile Okal at Northwestern University and Douglas MacAyeal at University of Chicago were able to observe new icebergs floating off to sea shortly after the sea swell of the tsunami reached Antarctica. The scientists were able to watch the Antarctic ice shelves in as close to real-time as satellite imagery allows, and catch a glimpse of a new iceberg floating off into the Ross Sea. A closer look with synthetic aperture radar data from the European Space Agency satellite, Envisat, which can penetrate clouds, found images of two moderate-sized icebergs – with more, smaller bergs following in their wake. The largest iceberg was about four by six miles in surface area – itself about equal to the surface area of one Manhattan. All the ice surface together about equaled two Manhattans. The swell was likely only about a foot high (30 cm) when it reached the Sulzberger shelf, Brunt and her colleagues said. But the consistency of the waves created enough stress to cause the calving. This particular stretch of floating ice shelf is about 260 feet (80 meters) thick, from its exposed surface to its submerged base. The strength of the earthquake and tsunami were factors in the breakup and so was the condition of the ice in the region, says Brunt. The lack of nearby sea ice; the lack of coastal ice, also called fast or landfast ice; and the lack of pack ice made the portion of the Sulzberger Ice Shelf that broke off susceptible to the incoming waves from the tsunami. The proof that seismic activity can cause Antarctic iceberg calving might shed some light on our knowledge of past events, Okal said.